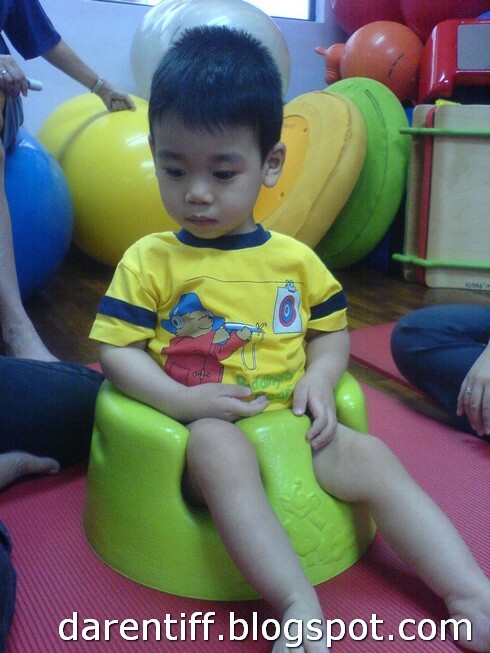 Here is Nathanael sitting on the JUMBO Seat during his Physio Therapy at HUKM. The JUMBO Seat helps supports the back and the photos & video shows him sitting upright on his own. 🙂 YAY!! When he was little we tried putting him in one before, but he just couldn’t fit into it, now leaner and thinner … he fits into it pretty well. Nathanael’s therapist puts a blue table in front of him and gives him further stimulation with toys that makes differnt sounds when a button is depressed. Here’s a Video of Nathanael in the JUMBO Chair. U can also Click Here to view the Video.